Reid Antony Railton, Cheshire-born automotive engineer par excellence, created an extraordinary range of cars. He rose to renown during the 1930s as chief engineer at Thomson & Taylor, Brooklands-based racing-car builders. There he realised the dreams of that era's top men of speed, including Tim Birkin, Malcolm Campbell, Whitney Straight, John Cobb, Raymond Mays and Goldie Gardner. His great cars powered them all to sensational racing and record-breaking success. 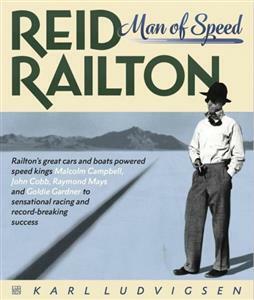 This magisterial book, by one of the world's foremost automotive historians, tells Reid Railton's personal and professional story in superb detail and fascinating depth, with special focus on Reid's unique insights - amounting to genius - and technical accomplishments. This is a 2 volume hardback set in a slipcase.